Famed for its wide, tree-lined boulevards and Belle Époque buildings, Bucharest City was once known as Micul Paris, or Little Paris of the East. This is no surprise, as the city was designed and remodelled by French and French-trained architects in the late 19th century. And just like Paris, Romania’s capital has its own triumphal arch—in Romanian, the Arcul de Triumf—on swanky Şoseaua Kiseleff Avenue. But the variety of Bucharest’s architecture—from Byzantine churches to Communist blocks—is more varied than that of the city it’s compared to. A lot of the older buildings, though, are in need of repair. Bucharest has an odd but not unpleasant mix of elegant and grand historical buildings juxtaposed with austere Communist-era and modern-day commercial structures. The lush Herăstrău Park and Botanical Gardens up north and the vast, man-made Cismigiu Lake in the centre of the city help ease stress or inspire artistic minds. Flower-sellers , sidewalk hawkers selling old-world curiosities, and dusty antique stores are a contrast to nearby supermarkets and shopping malls. Bucharest’s performance venues range from the stately National Opera House to swinging jazz cafés and hip nightclubs. Bucharest is one of the most populated cities in the European Union. The country’s newfound wealth resulting from its recent addition into the EU is highly visible in the city. Revitalized infrastructure has resulted in a retail boom (as seen in a growing number of supermarkets and shopping centres put up each year), as well as a construction boom (with the many trendy residential areas and tall office buildings being built). Since the fall of Communism in 1989, several giant circular edifices known as “hunger circuses”, once used as systematic food distribution areas, have been turned into shopping malls; one even into a Marriott Hotel. Their central locations have turned them into prime real estate. The city’s crime rate is relatively low compared to other Eastern European capitals. 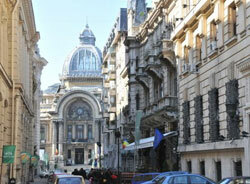 It is also less expensive to stay in Bucharest than it does in neighbouring capitals Prague and Budapest. 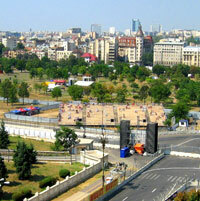 The demand for residential areas in the Bucharest municipality has risen over the years. Divided into 6 major sectors, Romania’s capital offers diverse options for property investment. Though land has become scarce in the city’s centre, there are other quieter and more sizeable areas around. In the northern parts of Bucharest (such as the sector 1 districts of Băneasa and Herastrau Park) one may find many villas and apartment buildings, home to expatriates holding administrative positions in various companies in the city.